On Wednesday, March 2nd, my mom and I started the Slim-Fast 3.2.1 program in hopes that we'd both lose a little weight in these last 4 weeks before The Big Day. Because this is such a big deal for us "non-dieters" I thought I'd share it with you! 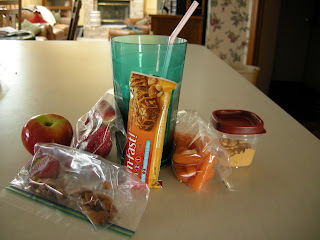 As my mom and I stick to Slim-Fast in these next few weeks I'll give weekly updates. So here's Week 1! Today was pretty easy. I thought I'd be starving by the time lunch rolled around, but surprisingly, I was only a tad hungry. I took a speed-walk (soccer mom style) in the gorgeous weather to get moving. By the time dinner time came and went (since I can't eat at work) I was STARVING. When I got home I had half a plate of angel hair pasta with shrimp, carrots, and celery and half a plate of green beans. No cheating today = SUCCESS! 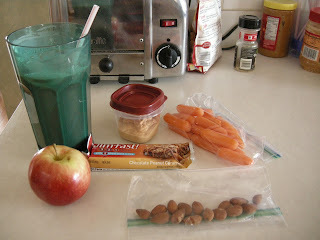 Slim Fast Creamy Chocolate shake, apple, 20 baby carrots with 2tbsp red pepper hommus, Slim Fast Chocolate Peanut Caramel meal bar, and 15 almonds. Today was a bit harder than yesterday. My body's still getting used to eating so little, so I was pretty groggy today. Hunger level during the day was about the same as yesterday, but again, dinner time was the worst. Not eating until 9pm is definitely getting to me. Tonight I had a mini meatloaf with broccoli and purple potatoes. No cheating today = SUCCESS! 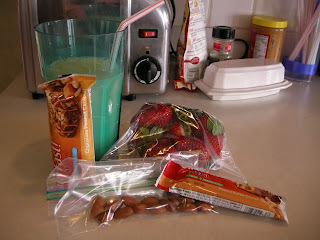 Slim Fast French Vanilla shake, 7 strawberries, Slim Fast Peanut Butter Chocolate snack bar, 15 almonds, and Slim Fast Chocolate Peanut Caramel meal bar. Working at home all morning is a trap. Snacks are readily available, so keeping myself accountable was a challenge today. It was rainy outside and I was busy addressing envelopes all morning, so I didn't have a chance to exercise before work. For dinner I had the same exact meal as last night, but that's okay because it's one of my favorite home-cooked meals! No cheating today = SUCCESS! 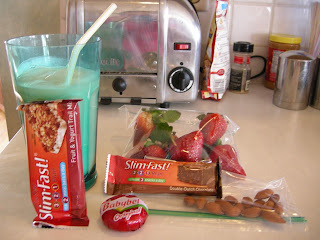 Slim Fast French Vanilla shake, 7 strawberries, Slim Fast Double Dutch Chocolate snack bar, 15 almonds with original Babybel cheese, and Slim Fast Fruit and Yogurt meal bar. Today was just alright. I worked this morning and got VERY hungry by the time I got home, so I ate a bowl of angel hair pasta with shrimp (leftover from Day 1). Then we had company over for breakfast-for-dinner and I ate a vegetarian quiche (filled with tomatoes and spinach. yum!) and a blueberry muffin. So...I cheated a little bit, but not excessively. Small cheat today = Small success. 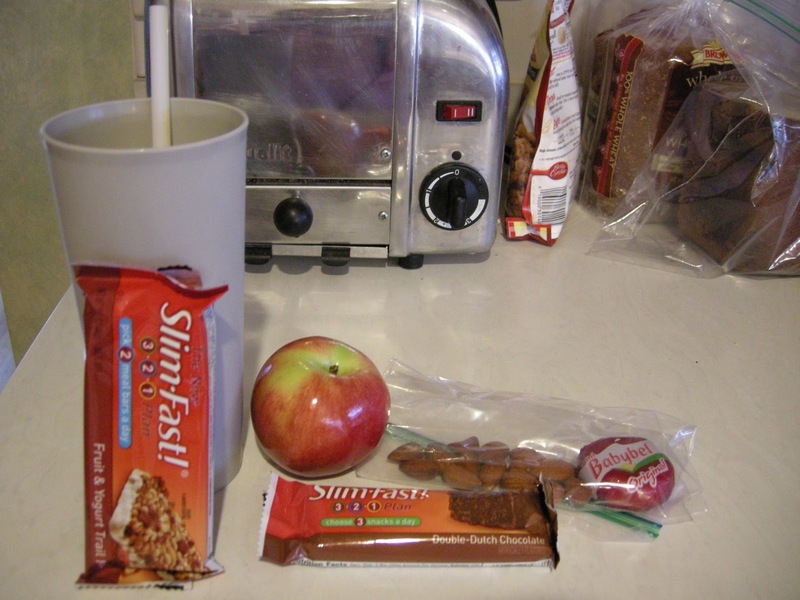 Slim Fast French Vanilla shake, apple, 15 almonds with original Babybel cheese, Slim Fast Double Dutch Chocolate snack bar, and Slim Fast Fruit and Yogurt meal bar. I really wanted to cheat and eat Panda Express for lunch today as I was running errands all day, but I resisted! Yay me! I stuck to the plan today (for the most part) and had a plate of fresh roasted turkey, mashed potatoes, and green beans for dinner. No cheating today = SUCCESS! Slim Fast Creamy Chocolate shake, 7 strawberries, 20 baby carrots with 2tbsp red pepper hommus, and 15 almonds with original Babybel cheese. I skipped the Slim Fast Chocolate Peanut Caramel meal bar and the apple today. Today it was semi-easy to stay on track with the Slim Fast plan, but the last 2 days I've actually been eating LESS than what's on the plan. Yesterday I accidentally skipped the meal bar and one snack so I told myself I'd eat them today, but running errands caused me to forget about them once again. But for dinner I had the bowl at Panda Express with fried rice and orange chicken and 2 potstickers. Semi-cheating today = Semi-Success. Slim Fast Creamy Chocolate shake, 15 almonds with original Babybel cheese, and Slim Fast Double Dutch Chocolate snack bar. 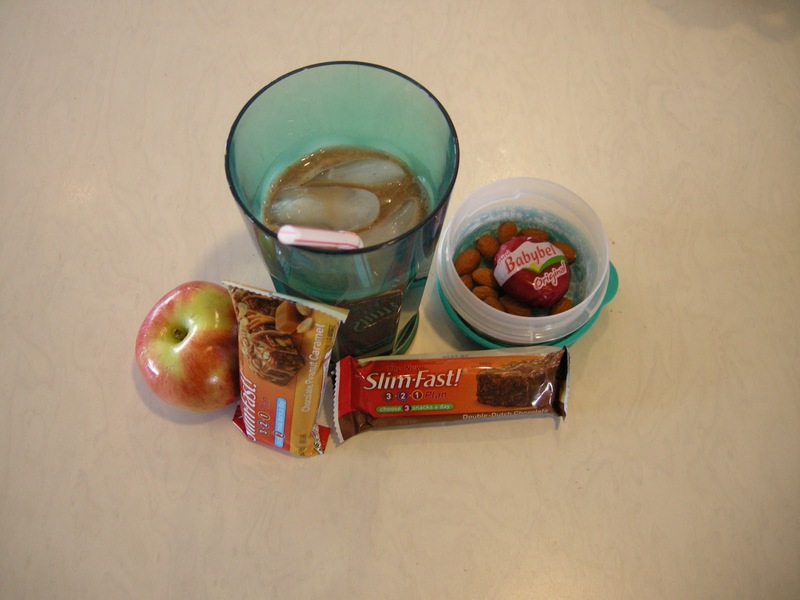 I skipped the apple and Slim Fast Chocolate Peanut Caramel meal bar today. Today was not so great for my Slim Fast plan. I did well in the morning, but after running errands I ate a plate of turkey, mashed potatoes, and green beans before work. After work tonight was bad. I had a Wendy's kids cheeseburger meal with fries and chocolate milk. Uh oh. Cheating = No Success. 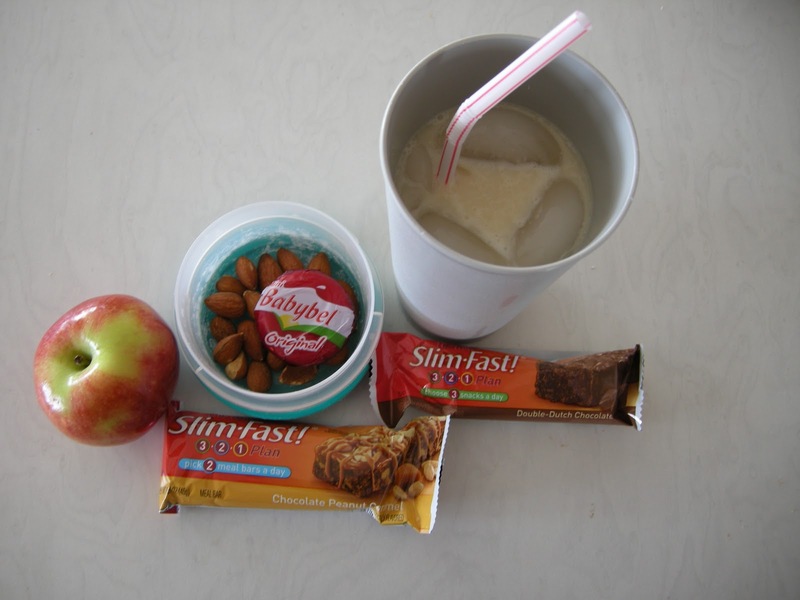 Slim Fast French Vanilla shake, 15 almonds with original Babybel cheese, Slim Fast Chocolate Peanut Caramel meal bar, and Slim Fast Double Dutch Chocolate snack bar. I skipped the apple today.